Just like so many others, I have also read Unbroken and found it one of the most compelling, inspiring and fantastic stories I've ever read. If you've not yet read it, do. Yes, the movie is coming out in just a few short weeks (and I am SO looking forward to seeing it) but don't let that be an excuse to let the book slip away from you. It is a spell-binding read. Dey Street Books sent me an e-mail a few weeks back asking if I'd like to read Don't Give Up, Don't Give In , written by Louis Zamperini (published posthumous). I couldn't say "YES!" fast enough. 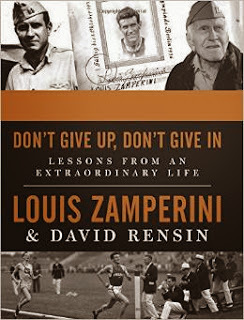 If you've got a Zamperini fan on your hands this Christmas, look for this book! It's delightful to read his take on his life in his own words. The subtitle of this book is "Lessons Learned from an Extraodinary Life" and it is co-written and edited by David Rensin. Basically this book is encouragement to continuing pressing on in life, giving it your all, and keeping a positive attitude. Zamperini believed that all things in life work together for good and he clearly enjoyed sharing that message with others. He lived with no regrets about his own life, recognizing that each thing that appeared to be bad on the surface ultimately ended up making him the man that he was. He couldn't change anything about his circumstances and so he wasn't going to waste time worrying about them. He's a "pick yourself up by your bootstraps and march on" sort of fellow and I like that about him. He doesn't waste time with pity and encourages others to follow suit. In today's society, that's a message that we need to hear. (I suspect in any society and any age, preaching against self-pity is quite important.) This new title, as I say, is an inspiring read and I'm glad to have spent a little bit of time with Zamperini again. If you haven't yet read Unbroken - (for shame!) - do that first. Then pick up Don't Give Up, Don't Give In . You won't find that hard to do, trust me. Many thanks to Dey Street Books for sending a copy of this book my direction in order to facilitate this review. I received no additional compensation and all opinions are my own. Do you have a Jane Austen fan on your list this Christmas? You might want to look up At Home with Jane Austen . This book is filled with beautiful full-colored photographs, period illustrations and family photographs of the Austens. 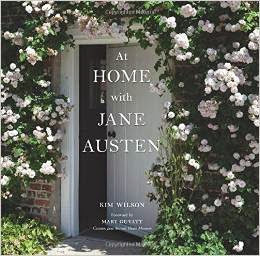 It explores the world of Jane Austen through the homes in which she lived which is a fairly unique take. At Home with Jane Austen is a coffee table-style book except it is more heavy on words than you'll find in most books of that nature. Besides talking about the history and architecture of the buildings, you learn about what homes and rooms might have inspired certain locations in Austen's books. You learn about the landlords, her father's position as locate curate and various members of the household staff. Then, of course, there are the photographs which make Americans want to pack up and move to England. (Ok, it makes me want to pack up and move to England. And you only think I'm joking!) I would thoroughly enjoy a stroll around Steventon, let me tell you. For people who dream of walking where Jane Austen walked and who wish to learn more about the practical side of her life, this is a fantastic title to consider. Many thanks to Abbeville Press who sent a copy of this title my direction in order to facilitate this review. I received no additional compensation and all opinions are 100% my own. Oh my goodness! How have I missed these?!?! Both of these look really good, especially the first one. I'm looking forward to the new Zamperini! I am on a waiting list at the library!